For clarity’s sake, when I say “Dave” I’m talking about panelist Dave Snyder. I’ll refer to our moderator by his full name. On SEM Synergy last week, the hosts asked what’s considered black hat in the social media space. Prepare to find out. Dave Evans welcomes the audience and gives us some background. 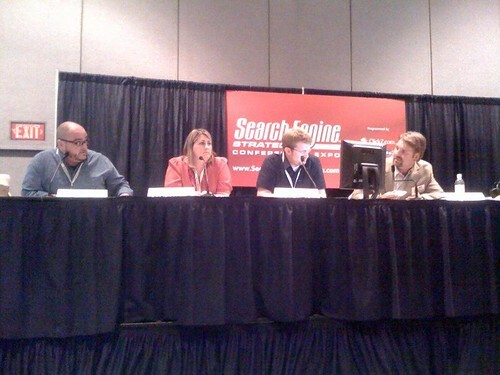 This session is part of the ClickZ/Online Marketing Summit track and as such it goes beyond search. He hopes to enter the larger conversation of how social media plays into search and into business as a whole. Social media is becoming a huge factor in decision making. People are looking for ratings and reviews and it’s affecting the purchase process. Plus, user generated content plays a role in search as well. So let’s look at how these things are used. He’s going to start with spam. There’s a notion of a war in the digital technology realm. Outrageous spam like the green card lottery in April 1994 is unfairly coloring the conversation. The real questions are focused on how to please the customer. Anything disingenuous or which deteriorates trust will work against your efforts. There’s a new marketing cycle that’s based on the ideas of what a consumer says a bout a product has a greater affect than it did 15 years ago. There’s also an issue of trust. Basic trust with regard to marketing itself is at risk. Let’s look at some examples. Paid reviews and the following apology is just dumb. Look at the case of the College Prowler. Profiles were set up under the guise of being a student. The brand was damaged when it was found out it wasn’t true. If you look at Dell, who’s using Twitter as a pure commercial outreach channel, compare it to other channels like TV or email. In TV or email, ads are given to you as an interruption. But on Twitter, it’s purely opt in. Someone can just unfollow Dell and their experience is back to ideal. The full disclosure, transparency and opt-out measure makes for a great marketing channel. Wal-Mart made a faux pas when they wrote an RV blog and pretended it was an independent writer. But now they’re smarter. They’re using Twitter the right way. It’s all about results right? How does disclosure factor into this? What about social media and SEO relationship? Lee says that the intention of being black hat is to get better results faster. But the consequence is having to manage risk. He sees white hat as a silly distinction — it’s marketing and there are rules (again, who’s making the rules?) and that has to be factored in as you decide what tactics to use. Dave says there’s no white hat/black hat. Black hat was a term used in SEO to define spamming. Unlike search where there’s a guideline set in front of you, the community guides the social ethics. Wal-Marting across America is not black hat, it’s stupid. It’s really important to understand how to utilize each platform. Each community has its own guidelines. There’s spam, then there’s automation, then there’s conversation. It’s different shades of gray. Look at how the community for each platform reacts to different marketing tactics. Beth says the community isn’t just customers. It’s stakeholders, analysts, etc. Again, it’s not what’s right or wrong, but it’s what works for everyone involved. Chris says there’s a TOS for every platform. And like Dave said, you have to identify the communities’ preferences. Dave Evans asks Dave Snyder to expand on the social ethics comment. Dave says that the biggest cross-over between search and social is link building. You’ll find a lot of poor content being submitted by some companies. You’ll all see really great content being submitted by companies. Polluting the platform means the effort won’t succeed. If it’s no good, there’s no way around the fact the community will reject it. Chris says social media isn’t the ends, it’s the means to traffic, community building and followers. It helps get your brand out there and get links. And people that just submit articles and press releases to Digg aren’t going to see any positive results. Lee is interested in seeing how the tactics have changed in the last year. There were some short term gains early on, but it was hard to sustain. The sustainable model revolves around quality content. And he sees the difference between white hat/ black hat as stupid/smart. Beth has an issue with ghost blogging and ghost tweeting. They don’t know enough about your company. Some products and services are very complex, and an agency will never know enough about the product to produce content that’s compelling to the community. And if you approach it as just putting in the buzzwords, the community will sense the BS. Chris asks if that mean no agency can work for SMO? He understands the point, but he says he knows how to take a company and give it the social media twist so that it will resonate with the community. So who writes the piece? Beth says the company should. Chris says, “Then why hire an agency?” Dave Evans says he gets the concern of a client that they don’t have the time for social media marketing. How willing is the brand to give up to control not only to customers, but also to an agency on their behalf. Beth says that when an agency takes on content creation for social media, the tactical effort is going to suffer. Agencies can fall into a trap if they write as someone else. If that someone else is ever asked about what they meant in that piece, the fact they didn’t actually write it becomes obvious. Dave says that Twitter has to be very transparent. He looks at his relationship with clients as a bullhorn, allowing them to communicate appropriately. He sees his role as teaching people how to use the platforms to communicate. Also remember that social media isn’t only about communication. It’s also about information sharing. It’s not 100% conversation. If you took comments away from YouTube, it would still be there because it offers information sharing. Of course, each platform is different and you can’t leverage it unless you know it. Dave Evans says that there’s new work and new opportunities for organizations. And somehow, someone has to talk on behalf of the brand with real technical knowledge. We have four agencies represented on the panel, with an agency approach to social media marketing. That’s clouding the conversation about black vs. white. It’s quick for you to dismiss stuff that doesn’t work as not best practice. But there’s really a lot of stuff out there polluting the platform. Dave says there’s definitely spam on social media. He has a lot of outrage over the actual platform because they provide all the tools to spam. As a social media user you get mad at the guy who sends you DMs about making $1 million dollars. But we don’t get mad at Twitter for their API that makes it easy for this spam to occur. Lee asks, are you going to get mad at the telephone for interrupting your dinner? Dave says he does. :P He says the platform is as accountable as the user. Dave Evans asks about the Burger King Facebook app that had people de-friend people. The app was shut down quickly because apps can’t let people know when they’re being de-friended. It doesn’t help the development of the community. Is that an issue? Dave says you’ll get a reaction from the platform when you take away they’re ability to make money. Beth and Chris seem to be at odds on the agency role in PR 2.0. How does a company help foster and create a PR rep for their brand? Beth says the biggest problem is not knowing what different employees’ strengths are. Don’t put employees out there who aren’t social and don’t have a personality. If you don’t have a brand that someone wants to engage with, don’t get involved in social media. Lee has a brick-and-mortar client who’s got a blog. People applying for jobs are actually tested on their writing ability. They’ve gotten tons of great content on the employees who contribute to the blog. Chris says that he doesn’t disagree with Beth’s point about ghost writing for a client. But he would review it and make sure it communicates in the right way to the community. What about automation with social media? I’ve been using automation on my personal Twitter account for a year and haven’t had any problems. I think my followers and I have an engaging relationship. Dave says if you’re doing that with clients you better be aware it could cause your account to be banned. Sure you’re doing it on your personal account, but you’d never do it on your company account. It comes back to risk management. When are we going to get rid of black hat, white hat terminology? Chris says SEO doesn’t own the term. It came from programmers. Lee asks if there are any communities that are good at policing itself. Craigslist, Wikipedia and Reddit are mentioned as platforms with communities that organically police themselves. Lee thought years ago that communities would police themselves but today he’s not seeing that as much as he thought they would. Should large media and news companies be submitting their own work to bookmarking sites? Dave says it’s a good way to get banned. Chris says that even if it’s Digg worthy, it’s better that the company focus on ways to create great content. Focus on spending time figuring out ways to make stuff the community likes. Dave Evans says that publishers voting for their own stuff looks funny. Chris suggests that if your company model relies on it, find someone in your company who is truly involved in the social media site and has real relationships in the community. What if you have employees are directly engaging with your customer through social media? Dave says a company needs to consider what they’ll do if that employee leaves. He doesn’t have an answer and is waiting to see how it plays out. Lee says that there’s a lot of equity and brand that leaves when the employee leaves. Name a brand that was damaged by a social media faux pas. It’s never happened. Nobody cares. Lee says it’s less about customers than it is about industry analysts. Beth says you can just push messages, but it comes down to how effective it is. Dave says it comes down to building effective campaigns that get results for clients. Chris says if you want to catch a terrorist you hire Jack Bauer. If you want a successful online marketing campaign, it might get messy, but Jack Bauer’s going to get the job done. Chris says if you want to catch a terrorist you hire Jack Bauer. If you want a successful online marketing campaign, it might get messy, but Jack Bauer’s going to get the job done. Up to that point, this discussion was firmly rooted in the real world – and that made it worth reading. One reference to pop fantasy took the shine off.